PLEASE NOTE: All travel funding has been awarded for the Spring and Summer 2019 terms. The application will be opened once again on August 15, 2019 for the Fall 2019 term. 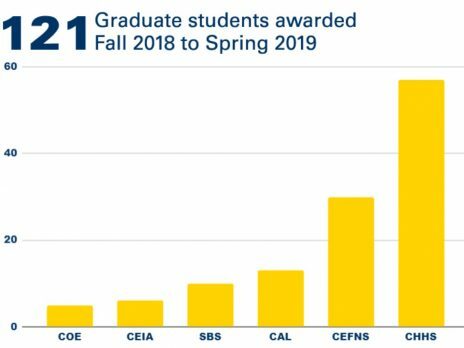 The Graduate Student Government awards approximately $60,000 annually to NAU graduate students traveling to present or attend conferences pertinent to their degree program. This travel money is also available to students traveling for their research, scholarship, creative activities, or career development. NAU graduate students are eligible for one award during each academic year. The GSG accepts applications and funds travel between two time periods: September 1 to February 28 and March 1 to August 31. If you are traveling between September 1 and February 28, you may only apply during that time period. If students are notified that all funding has been distributed for a particular funding period, they may still receive a travel award if unused funds are returned to the Graduate College prior to their travel. If travel bridges the two funding periods, or if travel lies within the first week of March, contact GSGTravel@nau.edu for an exception to the application window. The general travel award may be used for domestic or international travel. All applications must be submitted electronically by filling out the NAU Graduate Student Government travel award application. The application will be made available on 8/15/2019 for the Fall 2019 term. Applicants are encouraged to submit their applications as early as possible within the application/award timeframe, to provide lead time for planning and taking advantage of early bird registration fees and savings on airline tickets/hotel accommodations. Please read the instructions carefully before filling out the application form. For an application to be considered complete, the faculty/department sponsor for the student must submit an email directly to GSGTravel@nau.edu indicating support of applicant travel. If we do not receive an emailed confirmation of faculty support by the application deadline, you will not be eligible for funding. Travel funds are awarded once per academic year (however, if a student does not utilize their award, they may apply for another). The GSG distributes awards as a reimbursement (i.e. after you have traveled and submitted acceptable receipts). You will need to work with your department’s travel specialist to receive this reimbursement. Please contact them prior to your travel to complete any paperwork (including anything required prior to travel) to receive your award. All receipts will be submitted to your department travel representative for allowable expenses. Please Note: Students and Departments must adhere to NAU Travel Policy guidelines for proper reimbursement. If a department or student fails to submit the proper paperwork for reimbursement from the GSG beyond 30 business days, their award will be revoked. Separate international travel awards are available for outstanding NAU graduate students traveling to a conference outside of the United States, Mexico, and Canada*. One $1,500 award will be awarded per Fall and Spring term. Application deadlines will be November 15th and February 15th for the fall and spring terms and award winners will be announced by December 1st and April 1st, respectively. Awards can be used for travel within the current academic year. Must have completed at least one year of their graduate program. Must be presenting at a conference (no workshops are considered) that is outside of the United States, Mexico, or Canada. *For those traveling to Mexico or Canada, please refer to the general travel awards. A confidential letter of recommendation from an advisor or committee member. The advisor or committee member must submit a confidential letter of recommendation to GSGTravel@nau.edu. The advisor must expand on the progress of the student in the program and how this conference experience will help the student prepare for a career. A presentation during the Graduate Student Government luncheon with President Cheng. Applications will be judged on the quality of the statement and value to professional development, recommendation of the advisor or faculty sponsor, monetary need, and impact of the research and conference to be attended. Graduate students receive only one travel award per academic year (defined as July 1 through June 30). Students can apply for the general travel award program if they are not chosen for the award. The student can reapply for the award the following semester if they are not awarded. Conferences in Mexico and Canada are not eligible for the international travel award; workshops are not eligible for the international travel award.